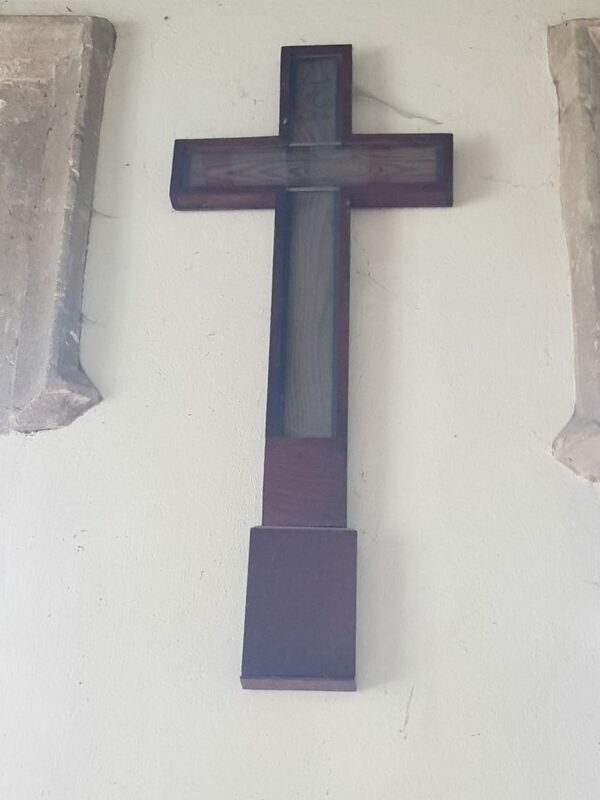 The Cross is in the memorial chapel mounted on the wall in the casing . I have taken the details regarding size from an old church inventory. The inventory actually says ERU but I am sure this is a typo as the GRU reference has been located by the CWGC. 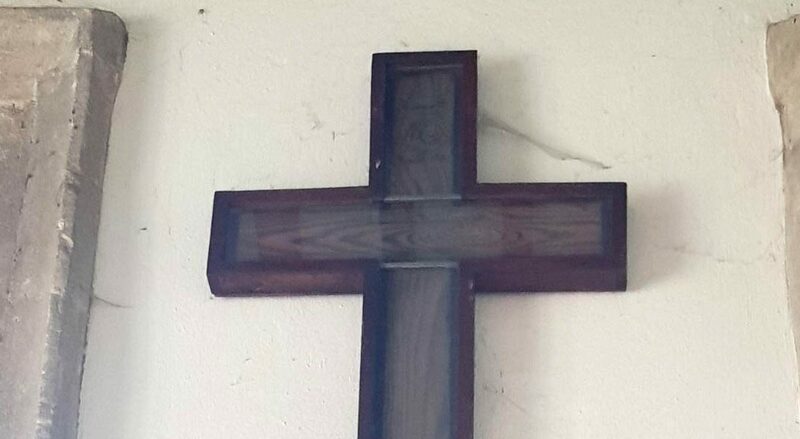 A cross was found in the church in the memorial chapel located on the wall between the two windows. The CWGC have extensive records that show the soldier was a member of the Royal Warwickshire regiment 1st Battalion and that his remains were found at the French cemetery in Frezenberg and reinterred at Tyne Cot. They were able to establish his regiment from his clothing and equipment but not his identity. In the 1920’s the Imperial War Graves Commission (IWGC) replaced the temporary markers with the Portland stone headstones. The original wooden crosses were either returned to families or churches. The British Legion and Toc H also distributed returned crosses. The Toc H crosses were in a glass cases not unlike the one in the church so it would be interesting to see if the church have any further records. If I find out anything further I will update you. 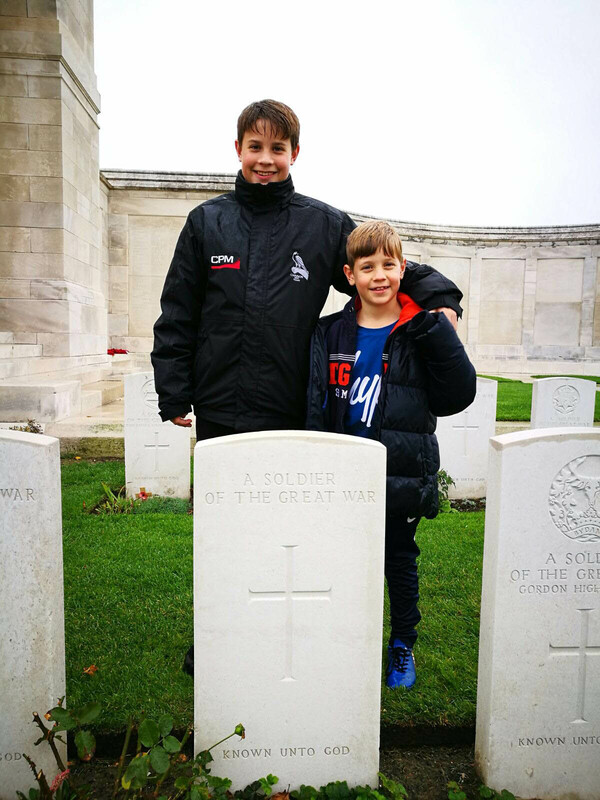 Two young men Finley and Barney Spencer went to Tyne Cot and found our unknown soldier’s grave. The research for the origins of the Battlefield Cross led me to a memorial in the churchyard that has fallen into disrepair. Michael Collins cleared the area around the yew tree to reveal the memorial and the broken cross. Angus Dorrach. Killed in Action, Ypres, 18th September 1917, aged 45 years. I was fascinated to find out why this gentleman had been in the Army at the age of 45 years so I started to search the CWGC website and found out that he had been in the Australian Imperial Force (AIF) 19th Battalion. In order to find out more information I researched censuses, contacted the CWGC and The Australian National Archives. The ANA have Private Angus Dorrach McKechnie 1260A complete service history online. Angus Dorrach McKechnie was married to Helena Rist in 1901 and they had 4 children born between 1903 and 1908, and lived around the Northfleet/Gravesend area. Angus was a twine keeper in the cable making industry. The maximum age to enlist in the British army was 38 years old. On the 4 March 1915 he had made his way to Sydney, leaving his family in the UK and enlisted with the AIF 17th Battalion. Initially he had to go to a dentist to have his teeth fixed before they would accept him. He was sent for training to Liverpool military camp about 35km from Sydney and then to Gallipoli as part of the ANZAC force that landed there for the August Offensive in 1915. The AIF 17th Battalion fought in the Battle of Hill 60 and Angus was wounded in action on the 26.08.1915. He was taken to the ANZAC field hospitals on the islands of Imbros & Lemnos (Port Murdos) before returning to duty on the 3.10.1915. He then developed jaundice and was sent to Luna Park near Cairo on the 30.10.1915. Luna Park was an amusement park that the ANZAC’s used as a hospital and there are photographs of the merry go round and ice rink being used as hospital wards. In December 2015 the troops were evacuated from Gallipoli and Angus was sent to Belgium via Marseille where he was hospitalised with deafness. In Oct 1916 he was sent to England where he was again admitted to hospital with a carbuncle on his back. In January 2017 he was transferred to the 19th Battalion and the company marched to Weymouth en route to Etaples and the Western Front. On the 18th September 1917 Angus was killed in action in Ypres and his remains were never found. As well as his name appearing on the roll of honour at Menin Gate, he is also listed on the National Australian War Memorial in Canberra. In this, the centenary of Angus Dorrach McKechnie’s death, I would like to repair the memorial and have received a quote of £300 + vat. If anyone would like to make a donation it would be very welcome. Please contact Lorraine Stevens 07712 529766. I would also like to find any relatives of the McKechnie’s as I have found out some very interesting facts about the family history so if anyone has any details of their whereabouts please let me know.